The 2019 Worthington Service Day presented by Leadership Worthington will be held on Saturday May 4, 2019. For the last 26 years, Service Day volunteers have helped senior citizens and other Worthington School District residents in need with chores such as inside/outside cleanup, running errands for shut-ins, and light landscaping such as weeding, planting flowers or spreading mulch. Breakfast, provided by the Kiwanis Club of Northern Columbus, will begin at 8am at Kilbourne Middle School, 50 East Dublin-Granville Road. Jobs will be handed out between 8:30 and 9:00am with volunteers heading out into the community between the hours of 9am and 1pm. For more information on volunteering, or to submit a job request, please contact lwserviceday@gmail.com, or call co-chair Kara Prem at 614.316.7317. Congratulations To The New CHCA Officers and Event Chairs! The CHCA also wishes to greatly thank our current Secretary, John Cecil, for agreeing to continue into his third year of service in this office, and our new Treasurer, as of January, 2019, David Nadolny! We also greatly appreciate Ken Paul, who served as our CHCA President during 2017 and 2018 for all he has done – and will continue to do to support our thriving neighborhood! We are deeply indebted to Jenny and Kelly for your many, many years of dedicated, extensive service to the CHCA, and for the integral roles both of you have performed in truly making our neighborhood the Friendly Community! The I Am Boundless organization, along with Neighborhood Design Center, will host an open house in Building M of the Boundless campus, on Tuesday, January 22, 2019, from 6:30 PM to 7:30 PM, 445 E Granville Rd, Worthington. For some background, please see the “Step By Step Academy Update,” 3/15/2018, blog post below (you can enter Step by Step or Boundless into the Search box, top right hand corner, to get to this blog post). 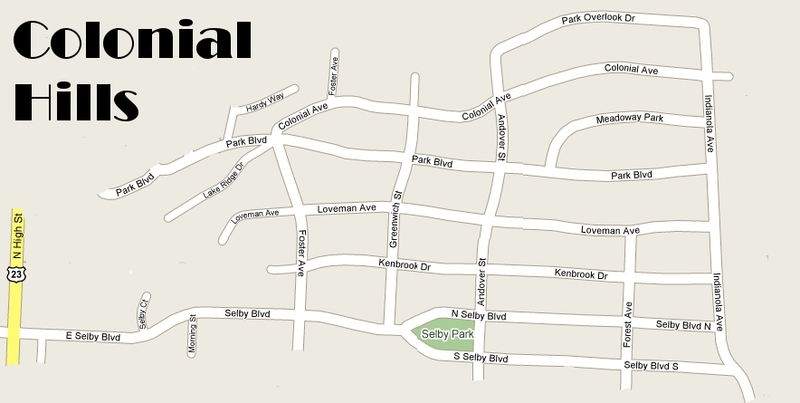 The Colonial Hills Civic Association (CHCA) Calendar of Events has been updated for 2019. Scroll down the list in “Upcoming Events” (in the right-hand column), and click on the event’s name, to get details such as when and where. Also, you can print out a month by month Google calendar with the CHCA events marked on it. Click on the “Calendar” tab (above) to get the current month’s calendar, and then click on the Print (my calendar) icon. In the “Calendar Print Preview” screen (and any additional Print screens your computer gives you), it is recommended that you print using the Landscape orientation. Also check the “black and white” box for better visibility, as some of the colors might not print optimally on your printer. And speaking of calendars and events – make sure that you look for your Colonial Hills 2019 Calendar of Events magnet included with the next Courier which you will be receiving in the mail within a few weeks. The article on page 1 in this Courier will thank both the sponsor of the magnet and our printer, who have combined to prepare this magnet for us at no charge to the CHCA! We certainly are a creative neighborhood! Our judges were impressed with the variety of our homes’ holiday decorating. Some homes are charming, sweet, nostalgic, fun or downright amazing – like the high star on Park Blvd, which our judges loved, but it defied category. Hmmm…. Thinking cap on……. It was a clear, cold night for judging, and we (our judges’ helpers/photographers) were thrilled to see an adorable red fox emerge from the brush at the corner of Park Overlook and Indianola – It ran down Indianola on swift little feet and hid behind some bushes before I could snap a good photo. If we were recognizing blocks, the judges’ favorites were the 200 block of Loveman and the 200 block of Colonial. But every street in the neighborhood had some lovely displays, so be sure to walk around after dusk and enjoy the splendor! Best Retro: 5731 Foster – Homage to the Grinch and the old fashioned Santas are charming! Most Artistic: 559 Colonial – Santa Dragons bearing gifts – 3 dragons! What fun!! Most Lit Up: 287 Loveman – A perennial favorite with a mix of lights and BIG blow ups! Best Front Door #2: 542 Park Blvd – Bright and Merry – We loved the lit up Fox; it was a sign…. Congratulations to the winners and to everyone who made our neighborhood sparkle for the holidays! The ghostly full moon shone overhead as our fearless judges’ helpers crept though the streets and yards of our frightening neighborhood, snapping photos and taking video for our esteemed judges. Witch’s hats off to all of you who made this event fun and difficult to judge! Colonial Hills is full of graveyards, skeletons, bats and ghosts…….. and a few surprises! The demonic delights included Ghosts playing “Ring Around the Rosie” on Kenbrook, a dragon on the 500 block of Colonial, cemeteries at 283 and 291 Kenbrook, and bats on the windows in the 100 block of Loveman. Hauntingly charming were the cornucopia at 175 Loveman, and the lovely lighting with spiders and Peeking Tom skeleton at 5644 Indianola. It was really hard to find and see your addresses sometimes, so I am sorry that some are missing. Neighbors: Take a walk at dusk and enjoy all the decorating! Don’t miss the 200-300 block of Loveman, which is fabulous. Huge Black Cat and graveyard at 287 Loveman, A pirate Themed house at 322 Loveman and a Big Wing Waving Dragon at 306 Loveman. Wow!! Spookiest: 363 Loveman with its truly creepy graveyard and huge bat. Spook house too!! Best Effects: 570 Kenbrook with its Ghostbusters theme, purple lighting, Hologram ghosts in the windows and a big Stay-Puft marshmallow man! Our judges wished that they had a few more categories to award. Hmmmm….we will think about that. Enjoy the season…. The leaves are finally turning. On 9/11/2018 the CHCA joined the “Twitterverse.” The Civic Association will curate our user account @CivicHills to try to communicate major issues and events on Twitter. We will select, link and edit such news items from our other CHCA communication platforms Facebook, the Courier and the website. This means that even though you may not be a member of our CHCA Facebook community, but you are on Twitter, you would then be able to receive our most important news items in a timely manner. Just be aware that we will not be tweeting items such as the daily lost dog and kitty, found backpack or homeowner service questions and recommendations, as there’s just too many of these – that would be a fulltime job, and we’re just volunteers! 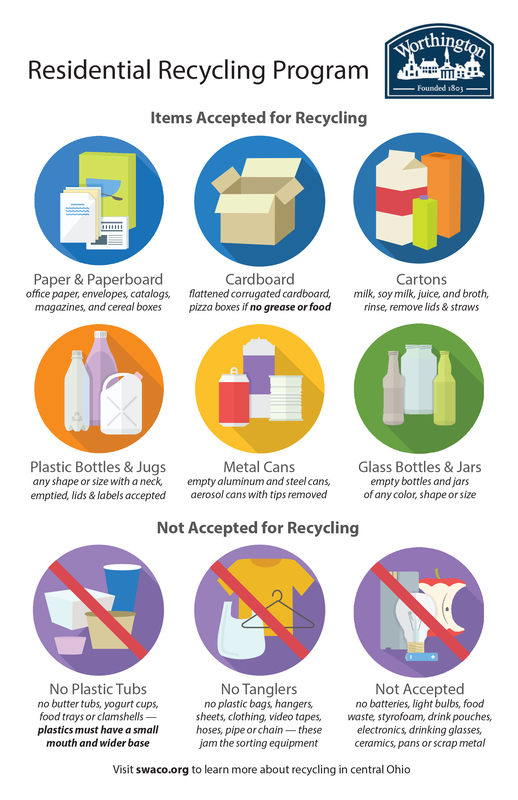 Not sure what goes in your curbside recycling bin? You’re not alone. For her Girl Scout Silver Award Project, Colonial Hills resident Andrea Nadolny has partnered with the City of Worthington to create a Residential Recycling Guide. Look for her Recycling Guide in the next issue of the CHCA Courier, or download a copy of the flyer here in PDF format or here in JPEG image format. Andrea has also created a Facebook page to share her project called Worthington Residential Recycling – A Girl Scout Silver Award Project.